Review: Worriers, 'Imaginary Life' On a razor-edged LP produced by Laura Jane Grace of Against Me!, Brooklyn punks stare down the judgment of peers, the corruption of institutions and the clumsiness of gendered language. As "Never Were," a standout from Worriers' 2013 EP Cruel Optimist, reaches the end of its charging first verse, the drums and guitars stop on a dime. In a few evocative lines, we've just learned of singer Lauren Denitzio's journey from inquisitive child to dutiful student to radicalized young adult, eager to risk life and limb in the service of protest. Then comes the punchline, naked and direct: "When you've got kids and rent, then come and see me." In the midst of a mini-memoir about growing up steeped in anarcho-punk politics, we get a gentle reminder that privilege touches cultures large and small — and the same act of resistance can get you slapped on the wrist or unmake your reality, depending who you are. It's a pretty nuanced critique, not least because its target is the person singing the song. 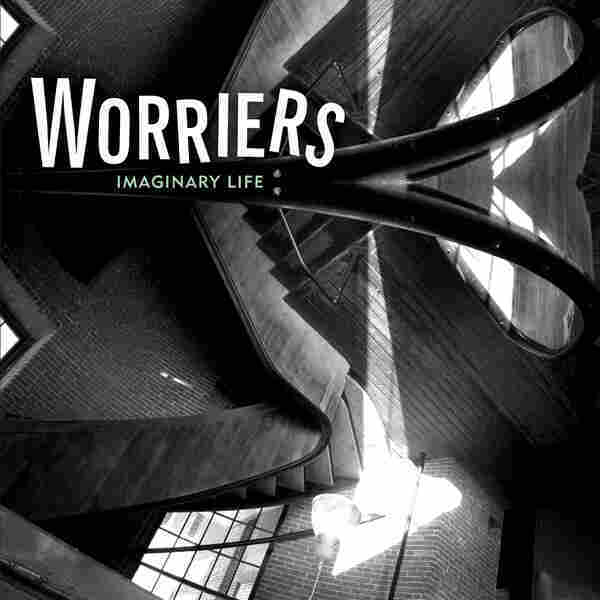 Imaginary Life, Worriers' first full-length and Denitzio's debut as sole songwriter after years in more collaborative arrangements, immediately reads as the work of someone older, wiser, more attuned to life's frailty and chaos. Even as the subdued opening track, "Jinx," catalogs the small blessings that sustain a creative existence — "some paper and pens and my hands and guitar strings," plus fulfilling work and, if you're really lucky, romantic love — each phrase trembles with the thought that all of this might be snatched away in an instant. Denitzio sings the final line, "Today I have all I ever wanted," into a void, where it floats unsecured until the rollicking drumbeat of "Plans" crashes through the silence and into the bustling present. Imaginary Life proceeds from a place of everyday precarity, where health and happiness are hardly a given and pursuing a dream can feel like jousting with fate. Thanks in part to the financial realities of music as a job and Brooklyn as a home, Worriers has cycled through lineups since its inception. (Full disclosure: I'm a musician, and once paid Denitzio to design a promotional item; we also both performed at an event in 2014.) For those who care, though, the band's got pedigree. Denitzio co-founded The Measure [sa], a prolific rock outfit that atomized in the late 2000s, just as the breakout of labelmates Screaming Females was sparking widespread interest in the New Jersey punk community that birthed them both. Some will also recognize Mike Yannich as the puckish singing drummer of The Ergs!, a beloved trio from the same stomping grounds that spent its decade together living up to its punctuation. Presiding over the sound of Imaginary Life is Laura Jane Grace, a punk-world figure who knows a thing or two about transcending category. The Against Me! singer, who took her band from basements to arenas and has lately turned her own story of gender dysphoria into a vehicle for helping others understand trans identities, signed on as producer and quickly arranged to bring Worriers along on tour by way of drilling the material. Where the group's earlier recordings are minimally arranged and shrouded in lo-fi haze, Grace focuses on supporting Deniztio's voice, a distinctive alto that can bruise when wrapped around the right words. The two are best matched when dealing in understatement — as when the stadium-filling guitars of "Unwritten" dive to the margins of the stereo field, clearing the way for a breathless chorus whose "choose your battles" message might otherwise have proven too subtle to land. Throughout these songs, whether grappling with the judgment of peers ("Good Luck"), the corruption of institutions ("Yes All Cops") or the essential clumsiness of gendered language ("They / Them / Theirs"), Denitzio and crew manage to turn ambivalence into an asset. It's a quality that extends to the band's name, an admission of fear transmuted into a battle flag. And it speaks to the experience of someone at once inspired by punk's ideals and wary of its rhetoric, who's seen enough to know that social pressure and prejudice exist even in communities self-defined against such things. In 2015, that's a signal worth amplifying. LANGUAGE ADVISORY: This album contains profanity.